They say a house is not a home without a pet. If one of your friends or family members reaches a new age soon and you’re in need of a gift or a stocking stuffer for this Christmas, you might find the market offer to be overwhelming. The generous variety of pet products available for sale might intimidate you, but we have compiled a list of popular products to simplify your research and boost your fun when gift shopping. Since a pet is what makes a house a home, providing the little friend with a new, comfy home is part of taking good care of the pet. If you know your friend is in need of such a product, you might want to consider the small animal home from Prevue Pet Products. The product is 32 ½’’-inch large, 19-inch wide, and 17 ½’’-inch high with 3/8’’ wire spacing, which makes it ideal for a wide variety of small pets. The item features a large entry door on top and one on the side for easy access and a 6 ¼-inch deep tubby base. Another option you might want to consider when looking for a product that will help you create a one-of-a-kind habitat for your pet is the CritterTrail Fun-nel tube from Kaytee. 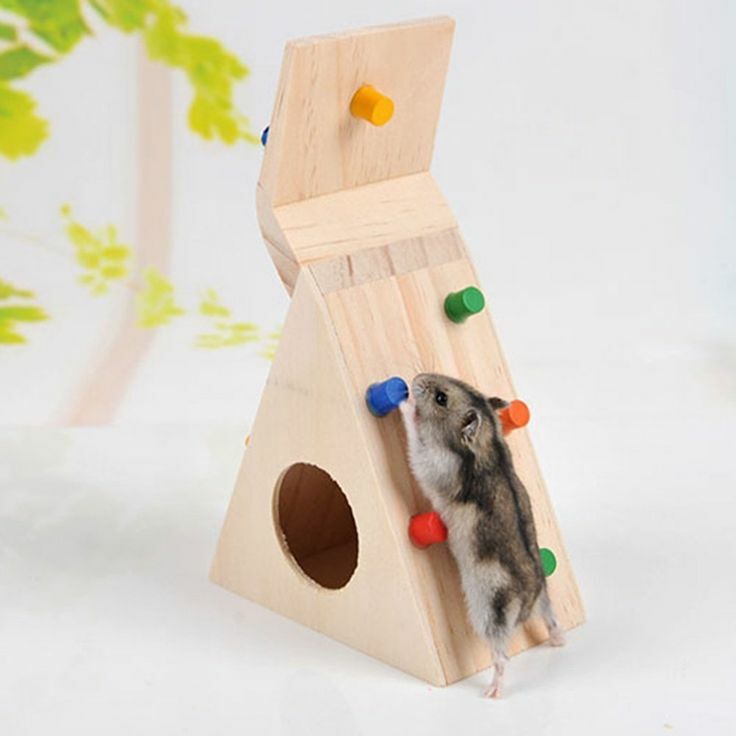 Designed to help hamsters, gerbils, mice, and other small animals explore and engage in exercises and healthy activities, this is more than a gift. It is a playful way to promote a healthy life. The product includes several parts you can connect according to your needs and your pet’s home dimensions. The connectable and expandable system will help you create new designs and thus help your rodent avoid boredom. Taking good care of your pet involves meeting the furry friend’s nutritional needs on a daily basis. Hydration should not be overlooked, either. That’s what Choco Nose had in mind when creating this no-drip water bottle for hamsters, mice, hedgehogs, and other small animals. With an 11.2-oz capacity, the bottle will provide your pet with the needed water in a durable and user-friendly design. Featuring a mini-sized, leak-proof nozzle to suit small pets, the item comes with a screw-bracket that makes installation easy and simple. The item is also BPA-free to ensure safety when using it. Keeping your small pet active is mandatory if a strong health is desired. Exercises should be part of your pet’s daily activities. If you need new toys or items to promote healthy habits, you might want to consider the Wooden Ladder Bridge from Niteangel. Ideal for hamsters, mice, and other such small animals, the bridge is made of wooden sticks, and can be attached in different shapes since it is bendable. The item won’t just encourage the pet to exercise more but is also ideal for chewing and makes a great shelter when your little friend wants to rest. A toy that will encourage your friend’s hamster or small pet to exercise is always an inspired gift. Exercises are a must if optimum vitality levels are desired. This exercise ball from Kaytee was designed with healthy habits in mind. The item won’t just promote such activities but will make sure performing them is safe. The ball is committed to providing interactive fun for the pet and pet owner alike. The 5-inch diameter renders it ideal for mice, hamsters, and other such animals. Moreover, it makes a great temporary shelter when you need to clean the pet’s home. If you want to greet a pet owner with a delicious treat for the little friend, you might want to check the Fiesta Hamster Food from Kaytee. Ideal for gerbils and hamsters, the food was formulated in such a way to meet a small animal’s nutritional needs while pleasing the pet’s palate. Since it is rich in natural antioxidants, the food will help improve the pet’s overall health and support the immune system. It also includes veggies and fruits to meet a variety of nutritional requirements as well as prebiotics and probiotics for enhanced digestive health. Is your friend’s hamster mad about chewing? Make sure it’s not the furniture or some of the pet’s home parts the ones that get chewed and provide the furry friend with a tasty treat if you go for the Triple Baked Crunch Sticks from Vitakraft. Boost that chewing fun with a vitamin-fortified formula that will satisfy the hamster’s need to chew as well as meet the pet’s various nutritional needs. The sticks come with specially selected grains, minerals, and vitamins that are essential for keeping the hamster healthy. They are glazed with yogurt and honey for enhanced palatability. If there’s an activity hamsters, chinchillas, and other rodents go a bundle on, that is chewing. A gift that encourages and boosts this fun is always appropriate as chewing keeps their teeth from getting too long. The 10 Lava Bite Pack from Keklle is an option you might want to check out before hitting the order button. Every chewing block measures 2.3 x 1.18 x 0.6 inches, which makes them ideal for gerbils, chinchillas, hamsters, and other small animals. They are made of natural lava stone that rodents prefer for keeping their teeth clean, trim, and healthy at the same time. With this item from eCOTRITION, you can rest assured that your gift will be a hit. The 3-in-1 product makes a great hideaway, a treat your pet will love, and a great log to chew. Made with honey and alfalfa, the Activity Logs will add extra enjoyment and fun to the rodent’s daily activities. Ideal for hamsters, gerbils, and other small animals, the Snak Shak will provide rodents with hours or stimulation and play as well as a 100 percent safe and edible treat. The log is 5 ½ -inch long, 3-inch wide, and 3 ½ -inch high. Help your friend’s pet bid boredom farewell goodbye with this grass toy from Prevue Hendryx. Designed for small animals such as hamsters, mice, and gerbils, this product will encourage the pet to explore and burrow. Made with 100 percent natural grass materials, the hut is an inspired gift that will keep the pets active or satisfy their need to nest. The natural sisal tassel has a sweet fragrance the pet will like. The grass hideaway measures 4 inches in length, 7 inches in width, and 3 ½ inches in height. It also features two entries/exits. Taking care of a pet is not the easiest job in the world, and it requires some time and a lot of care from you. Of course, once everything is said and done the fun of having a constant companion will outweigh the bad, but first, you need to equip yourself with all the necessary accessories that can make your life easier. You have probably noticed if you’ve already started prospecting the market for some cool hamster stuff that you have lots of options to choose from. Accessories and toys can ease both your life and that of your pet but knowing what to look for can take a lot of research. This is where our buying guide comes into play. We have compiled it in order to make it easier for you to choose the coolest products available for sale. Sometimes you need to know more, especially if you’re considering to buy some hamster stuff for a friend or family member. If you want to gift them some cool stuff you need to consider a couple of things. First, you need to consider what they already have, next time you visit them, you can take a subtle and quick look around. This way you can be sure that you buy exactly what they need. After noticing the many alternatives available we have concluded that for you to look at each and every one requires a lot of time, time that not everyone has at their disposal. Our buying guide has been compiled with your needs in mind, and it is here to help you in making your decision by showing you what the coolest product and best features are. With them, in mind, you will be able to make your own choice and get a product that is both fun and practical. In our research, we have looked at some of the best-rated hamster stuff reviews so that we can see what the best hamster chew toys, accessories and toys are. Take a quick read if you have the time. Just as kids, our pets need their own share of playing around. This is a way of making sure that they always have something to interact with and keep them alert. You have to consider that in a natural habitat they always explore and interact with their surroundings. A great toy can keep them busy for hours on end, allowing you to go about your business without having to worry about your hamster. Toys are also great because if you have a busy life and don’t spend a lot of time at home, with a toy your pet will be less likely to feel your absence. For a hamster, a chewing toy makes for a great choice. Not only will it keep them occupied, but it will also keep their teeth healthy and sharp. Hamsters, like many rodents, like to chew and chewing is their favorite past time. Make sure that you always leave them something to chew; otherwise, you risk having them start chewing things that they are not supposed to. Beside the practical usefulness of a toy, they can also make the cage that you keep your hamster in look a lot better. Your pet is not likely to care about the color of the product you buy, but you do, so you can easily accessorize the content of the cage and the cage itself so that it matches the design of your room and furniture. How about a larger cage? The best purchase you can make for any pet is allowing it a larger habitat for it to play in, and what better way than to buy a larger cage? A larger cage will give more room to explore and play. With more room, you will also have more space to add toys and accessories so that the habitat you create is a fun and great looking playground for your favorite pet. More space to roam around will surely keep it more occupied, but you can do even better than that. With more room available you can consider buying a playmate for your hamster. This way you guarantee that it will not lack socializing, especially as all animals enjoy having the company of members of their own species. 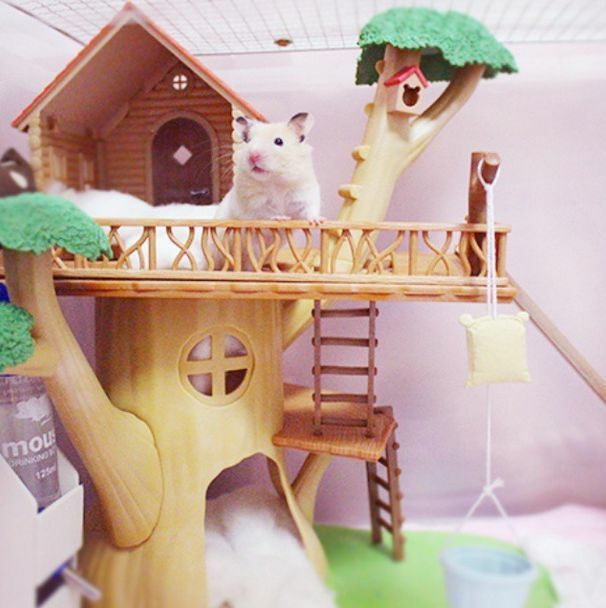 Hamsters like to borrow in the ground and create their own nests, and for this, you need to have some sort of bedding in your cage for them to play with. Your pet needs this if you want it to grow healthy and happy. Consider the kind of species you have when making this choice, you want to replicate their natural environment. Do consider that you will also have to change some of it when it gets dirty. Because a cage, no matter how large, cannot give the freedom and exercise your pet requires, you should consider buying a hamster wheel. This extremely useful accessory will not only keep your favorite companion fit, but it will also make them happy. As a plus, looking at them running on the wheel is one of those things that you can never get tired of looking at. Besides keeping them fit, you also want to keep them clean. Consider buying some cleaning products for your hamster that can make cleaning an easier task. As with any furry animal, a soft hairbrush can drastically improve the look of your pet, making the fur cleaner and shinier. To make your cage truly stand out, you can consider purchasing some cool accessories that are both visually pleasant, and that can also improve the life of your pet. You can buy a ladder for them to climb, logs for them to crawl through and even a labyrinth house that they can explore. What’s great about these options is that while they do improve your pet’s life, they can also work as accessories to your home. A great looking habitat can be a joy to look at, and when guests come visiting, they are sure to be impressed by what you have created.